There's something about January that brings me over all crafty. Not of the sly, sneaky kind (that's more of a September thing) but the Kirstie Allsopp, granny square, finger painting kind. All these long dark chilly evenings mean more time at home (no bad thing) but I start to get guilty after the fourth night in a row lying on the sofa, watching Poirot with the cats and not doing a single productive thing. Having already been super inspired by last weeks New Year's resolutions and fabulous Classes & Courses posts, I decided to go find myself a number of projects to keep me busy well into July. 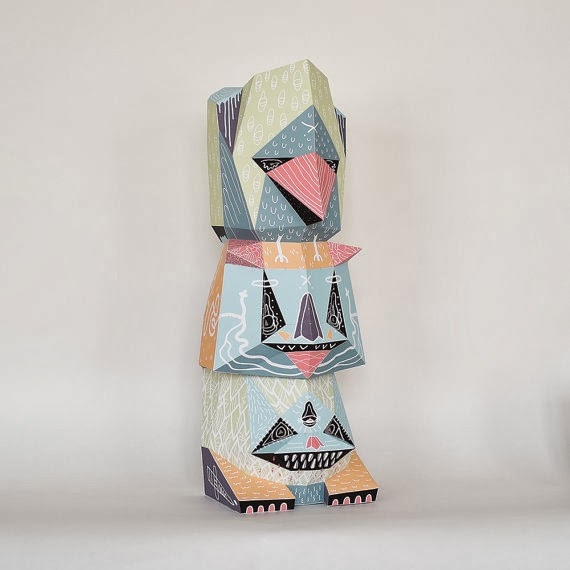 Lo and behold with good fortune I managed to stumble upon Austrian paper crafter Mostlikely on Etsy. 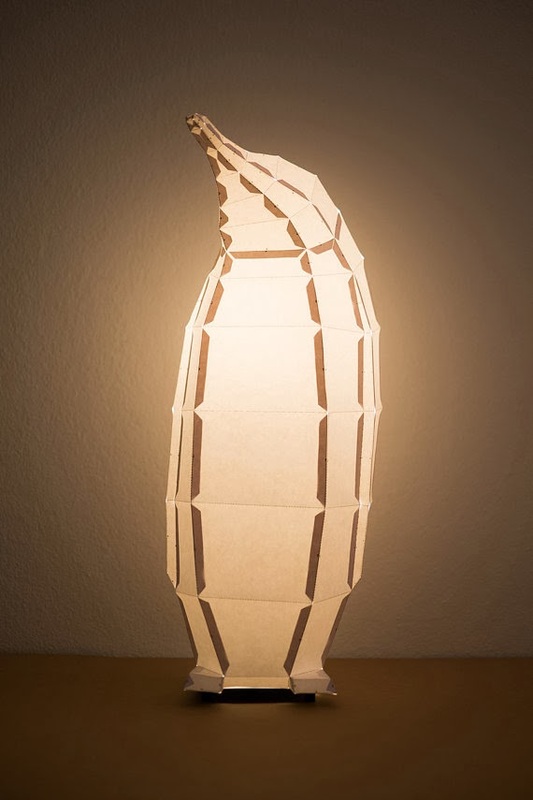 See that rather amazing Penguin Lamp? Can you guess how much a fabulous 2ft high lampshade like this might cost? £80? £120? Not even close, all of Mostlikey's plain paper lampshades cost only £34.08, that is crazy good. Like this adorable Owl. How cute is he? And he's 20 inches tall, that's a lot of lamp for that price. The rather ingenious bit here is that Mostlikely do all the measuring and printing, but YOU have to do the grunt work (i.e. the fun bit). 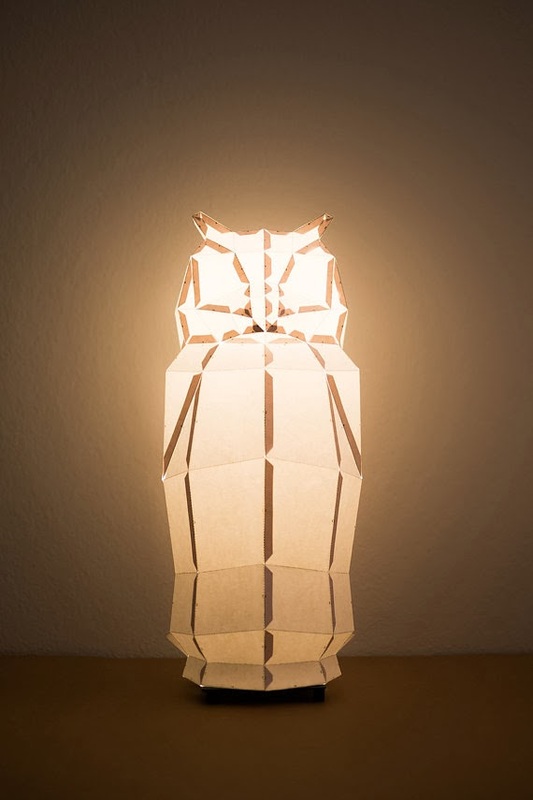 By cutting the pieces out, folding and gluing them together you'll end up with your very own Lamp of Exceptional Cool. Eh voila, a very easy project I can do in front of the TV which will result in something that looks expensive and make all my friends jealous! What else is home décor for? A fireplace! No, wait I mean a Mask! There's something about this picture that doesn't seem weird to me, it's seems I'm fully OK with the fact a graffiti-bear-man is kicking back with a good book by the fire. Totally normal. 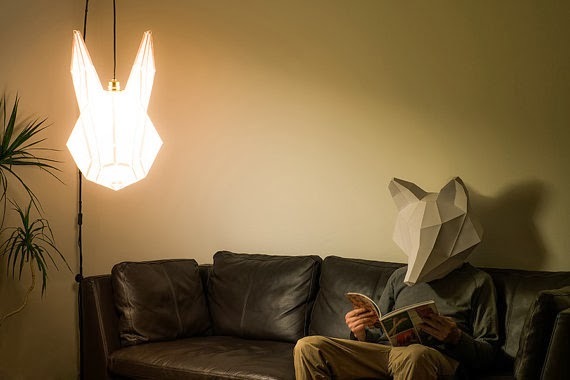 All the large versions of the lamps can be worn this way, say, if you get bored of your own face. Obviously avoid showering while wearing the paper mask. 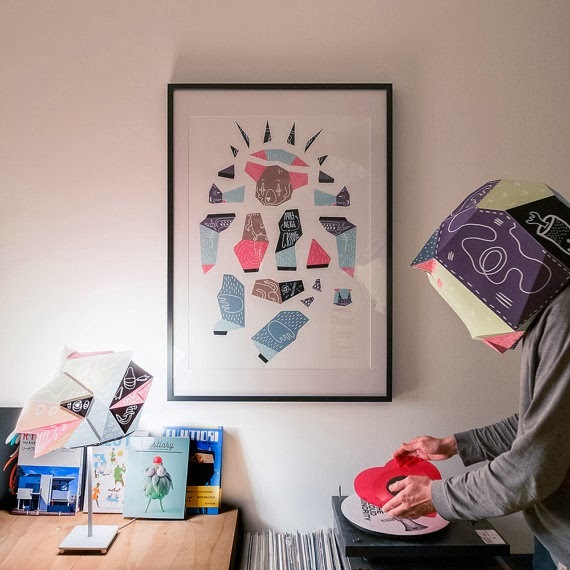 Mostlikely also suggest the pre-cut lamp can even be used as a poster, which is a rather ingenious way of storing one's unfinished projects, a sort of attractive reminder that you still haven't gotten round to doing that thing you planned to do. All orders come with the diagram printout on heavy paper to cut out, full instructions as well as a frame to attach it to your chosen lamp stand or light bulb should you not wish to wear it. I personally am rather in love with the Giant Fox head as it is delightfully modelled here. Might add some eyes to it though. Ooooh. 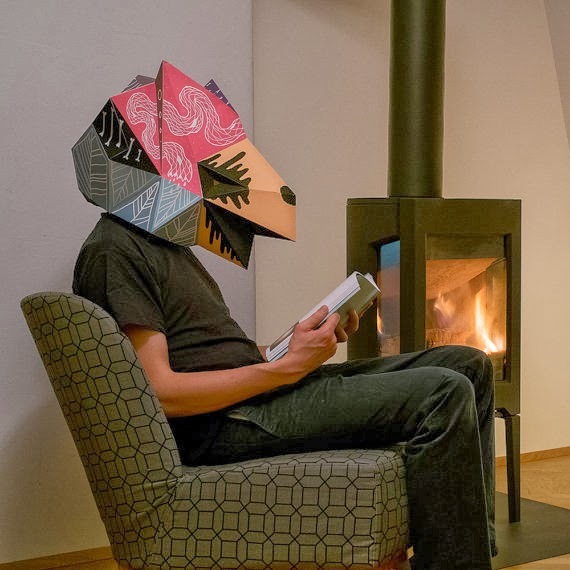 I want a paper fox head! No idea what I would do with it, but that's beside the point. Well obviously you wear while relaxing on the sofa with a good book.